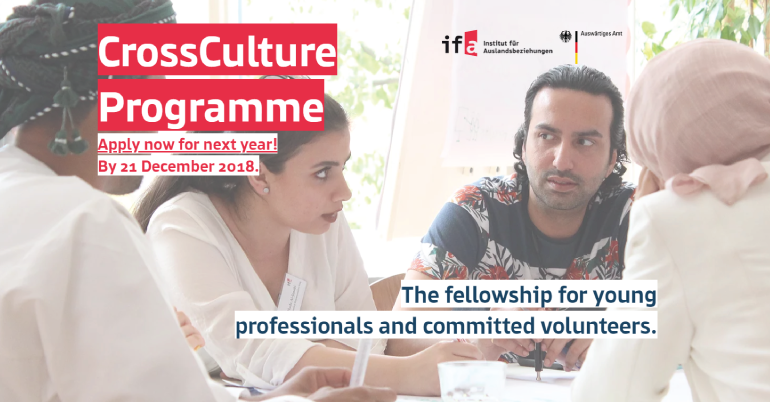 CrossCultural Programme 2019 in Germany (Fully Funded) - Apply Now! Application for CrossCultural Programme is now open! Do apply if you are interested! The programme is fully funded by the Federal Foreign Office of Germany and implemented by IFA. The CrossCulture Programme is designed for people between 23 and 45 who are committed to improving society through their work in relevant organisations. The participants come mainly from Muslim-majority countries (approximately 80% of all selected fellows) as well as from Germany. Step outside the cultural box and gain professional experience in a different cultural environment! The CrossCulture Programme (CCP) – conducted by the Institut für Auslandsbeziehungen (ifa) – supports you in this endeavour. 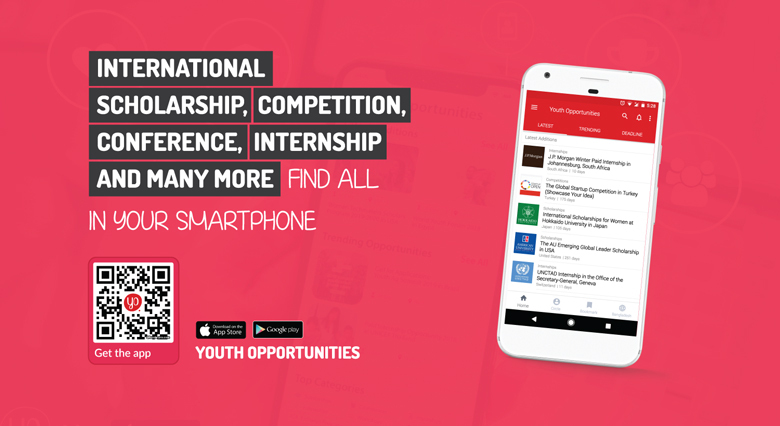 For more than 12 years, they have been enabling young professionals and volunteers to work for two to three months in Germany (for non-German applicants only) or in one of the 35 participating countries (for German applicants only). The intercultural and professional fellowship is funded by the Federal Foreign Office of Germany. Since CCP fellowships are planned and organised individually for each candidate, the schedules differ regarding timing and duration. The exact dates within the three terms are coordinated in detail with the respective host organisation and the CCP fellow. The round trip flight is booked and paid by ifa. Once your travel arrangements have been confirmed and you have received your ticket it is not possible to change its schedule. Extra or oversize luggage that is not included in your ticket cannot be covered by ifa. You will be informed about the conditions of health insurance and the services provided by ifa when you receive the Fellowship Award Letter. CCP fellows from abroad will be provided with furnished accommodation in Germany – either a room in a shared apartment or within a family or a small apartment with bathroom and cooking facilities. Electricity, heating and water are included. Internet access or a phone might not be available in the apartment, but can be bought by the CCP fellow. The apartment and the interior furnishings have to be treated with care by the CCP fellow. Guests are only allowed to stay for a few days after consultation with the landlord. Costs of any damages to the apartment, furniture or electrical items have to be covered by the CCP fellow. A long-term involvement in an organisation or institution within the country of residency is assumed. Applicants must be aged between 23 and 45 years. All candidates applying must be citizens of the above mentioned countries or should have been granted permanent residence of one of those countries. Moreover, the applicant must be in a good physical condition – physical as well as mental working capacity are needed for a long stay abroad. A good command of English is expected from all fellows. Knowledge of German is not mandatory but considered a plus. For German applicants knowledge of the lingua franca in the host country is welcomed (French, Arabic). Eligible Regions: Algeria, Bahrain, Bangladesh, Egypt, Indonesia, Iraq, Iran, Jordan, Kazakhstan, Kyrgyzstan, Kuwait, Lebanon, Libya, Malaysia, Morocco, Mauritania, Oman, Pakistan, Palestinian Territories, Qatar, Saudi Arabia, Sudan, Tajikistan, Tunisia, United Arab Emirates and Usbekistan. Applications for CCP are to be submitted online via our application portal. Do not send your application via e-mail to ifa as those applications will not be considered!